(18223, Oklahoma Historical Society Photograph Collection, OHS). Located in Oklahoma's northeastern region, Wagoner County was created at 1907 statehood. Surrounding counties include Rogers and Mayes on the north, Cherokee on the east, Muskogee and Okmulgee on the south, and Tulsa on the west. In 2010 the incorporated towns included Coweta, Okay, Porter, Red Bird, Tullahassee, and Wagoner, the county seat. The county has several archaeological sites that suggest prehistoric inhabitation. The Caddoan Mound Builders (A.D. 300 to 1200) are the most prolific. A late occupation, the Norman Site, lies just east of Wagoner in the present Taylor Ferry vicinity. In the 1930s University of Oklahoma archaeologists excavated there and determined it to be a sociopolitical center from around A.D. 1200 to 1400. Pottery and other artifacts found there are now on display at several Oklahoma museums. The topography of the county's 590.99 square miles of land and water is part of the Ozark Highlands, an area of wooded hills, small prairies, pasturelands, and many streams. Three rivers drain the region. The Verdigris River, now part of the McClellan-Kerr Arkansas River Navigation System, divides the county east and west. The Arkansas River wraps around the west and south sides. In 1942 the U.S. Army Corps of Engineers began impounding the Grand River, creating Fort Gibson Lake. The county's economy historically has been based on its natural resources, beginning with the abundant game in this Three Forks area where the Arkansas, the Verdigris, and the Grand join. While the county still has a strong agricultural base, the development of the lake covered a large amount of fertile farmland and elevated tourism to economic importance. In the late eighteenth century French traders and trappers worked the region. After 1803, when the United States purchased Louisiana Territory, which included present Oklahoma, Americans began exploring the area. These included James Wilkinson, Jacob Fowler, Thomas James, Nathan Boone, and Washington Irving. Several traders, including Nathaniel Pryor, Joseph Bogy, and Auguste P. Chouteau, opened posts in the Three Forks and shipped huge quantities of furs down the Arkansas River. The Osage Trace was a main thoroughfare across the area in the late eighteenth and early nineteenth centuries. The trace, which became known as the Texas Road some time after the 1820s, was heavily traveled during the Civil War. Later the Shawnee Trail, one of the first cattle trails, followed the path through the region. Railroads soon pushed across the prairie, beginning with the Missouri, Kansas and Texas Railway (the Katy) in 1871–72, followed in 1888 by the Kansas and Arkansas Valley Railway (eventually acquired by the Missouri Pacific Railroad) and in 1903–04 by the Missouri, Oklahoma and Gulf Railway (acquired by the Kansas, Oklahoma and Gulf Railway and then the Texas and Pacific Railroad). After the Creek signed an 1826 treaty in Washington, D.C., that provided them land in Indian Territory for their land in Georgia, they began to settle in the area. More tribe members migrated after 1832 when the Creek Nation in Alabama was dissolved. The far western portion of present Wagoner County belonged to the Cherokee Nation, which attained the land in 1828 in exchange for their land in Arkansas. These first Western Cherokee were joined by their eastern counterparts after the 1835 Treaty of New Echota, which sold the remainder of their land in southeastern United States. In 1843 the Presbyterian Board of Foreign Missions founded Koweta Mission, one mile east of present Coweta. Among the earliest educational institutions in the present county was the Tullahassee Mission, opened in 1850 for Creek students. At three stories in height, the main building was one of the tallest in Indian Territory. In 1881 the school was given to the Creek freedmen. During the Civil War the present county was the scene of one fight, known as the Hay Camp Action, or the Battle of Flat Rock. In September 1864 Confederate troops led by Brig. Gen. Stand Watie and Brig. Gen. Richard Gano attacked Union troops who were cutting hay, capturing eighty-five and killing more. The Southern soldiers then burned the hay along with the harvesting equipment. Confederates also housed troops on the Koweta and Tullahassee school campuses and camped at Choska and Concharty. Several All-Black towns that emerged after the Civil War and survived into the beginning of the twentieth century included Red Bird, Gibson Station, and Tullahassee. In 1905 it was proposed that present Wagoner County would be included in the state of Sequoyah. The proposal would have divided the area into two counties, with the western portion named Coweta and the eastern called Tumechichee. Instead, in 1907 it was incorporated into one unit when Oklahoma became a state. Naming the new county and selecting a new county seat became the first countywide political controversy. The towns of Porter and Coweta competed with Wagoner for the honor. The county took its name from the town that won. Wagoner's name honored Henry "Bigfoot" Wagoner, a Katy railroad dispatcher from Parsons, Kansas. 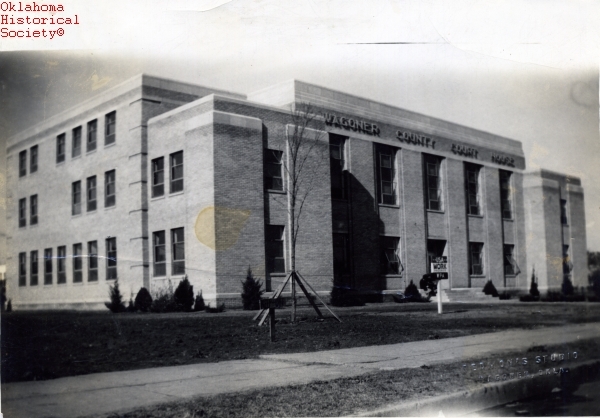 In 1923 by a special election Wagoner County annexed the community of Yonkers, removing it from Cherokee County. Agriculture has always spurred the county's economy. In 1907 farmers primarily planted corn (71,648 acres) and cotton (19,779 acres). In 1934 cotton farmers used 42,607 acres, and corn occupied 36,843 acres. In the 1930s soybean production began to spread. By 1967 Wagoner County's soybean yield ranked second in the state. Wheat (28,100 acres) surpassed other crops, and cotton (3,600 acres) and corn (1,100 acres) were lower priorities. In 2002 the county ranked first in soybean production (34,842 acres), as well as sod harvesting (4,887 acres), which was a burgeoning industry. Peach orchards near Porter have been a successful enterprise. These and the Stratford peaches produced in south-central Oklahoma form the bulk of Oklahoma's peach industry. Ranching also thrives in Wagoner County. At statehood the residents owned 11,072 total cattle and 4,327 horses. The number of cattle increased, registering 24,518 in 1935. By 1967 there were 48,000 head, and in 2002 the number stood at 41,480. Oil and gas have been extracted in the county since 1914. In 1934 the county produced 375,126 barrels of oil. By 1980 production had decreased, registering 67,879 barrels. That year, however, 15,256 million cubic feet of natural gas were produced. The natural gas figures steadily climbed, and in 2000 production rose to 70,273 million cubic feet, compared to 35,739 barrels of oil. Wagoner County has experienced population fluctuations related to various economic factors. At 1907 statehood the county had 19,529 residents. In 1910 and 1930, 22,086 and 22,428 people resided in the county, respectively. The population had declined to 21,642 by 1940. It fell to a low of 15,673 in 1960 and then began increasing. The 1970 and 1980 censuses reported 22,163 and 41,801, respectively. By 1990 Wagoner County, with 47,883 residents, was one of the state's fastest growing. The number of residents climbed to 57,491 in 2000. The 2010 census reported a population increase to 73,085, with 75.7 percent white, 10.0 percent American Indian, 3.7 percent African American, and 1.4 percent Asian. Hispanic ethnicity was identified as 4.8 percent. Transportation has aided economic growth. Formerly the Jefferson Highway, U.S. Highway 69 runs north and south through the county's eastern portion, and the Muskogee Turnpike crosses the county from the southeast to the northwest. State Highway 51 extends from Broken Arrow through Coweta and Wagoner to the Cherokee County line on the east. Other state highways that traverse the county include 16, 51B, 72, and 104. Among the county's most notable residents have been Bill and Vonette (Zachary) Bright, who founded Campus Crusade for Christ International, and Lt. Col. Ernest Childers of Coweta, who earned the Medal of Honor for valor shown during World War II. Coweta's George Milburn published many short stories and books about life in small-town Oklahoma. Several sports figures also came from the county, including Cleveland Indians' pitcher Willis Hudlin, major league baseball player Frank Linzy, University of Oklahoma and professional football player Rick Bryan, and professional bass fisherman Tom Biffle. Also of note in the sports world is Mr. Bar None, a Wagoner-bred quarter horse. Wayne Abbott, History of Southeastern Wagoner County, Oklahoma (N.p. : N.p., n.d.). Brad Agnew, "Wagoner, I.T. : 'Queen City of the Prairies,'" The Chronicles of Oklahoma 64 (Winter 1986–87). John Downing Benedict, Muskogee and Northeastern Oklahoma, Including the Counties of Muskogee, McIntosh, Wagoner, Cherokee, Sequoyah, Adair, Delaware, Mayes, Rogers, Washington, Nowata, Craig, and Ottawa, Vol. 1 (Chicago: S. J. Clarke Publishing Co., 1922). Kenneth Peters and Liz McMahan, eds., Wagoner People (Wagoner, Okla.: Kenneth Peters, 2000). Wagoner County History (Wagoner, Okla.: Wagoner County Extension Homemakers Council, 1980). Liz McMahan, "Wagoner County," The Encyclopedia of Oklahoma History and Culture, https://www.okhistory.org/publications/enc/entry.php?entry=WA003.